“The Paint Factory ” – 7″ x 11″, matted to 11″ x 14″ for easy, low-cost framing. Another Cape Ann Plein Air 2017 painting. 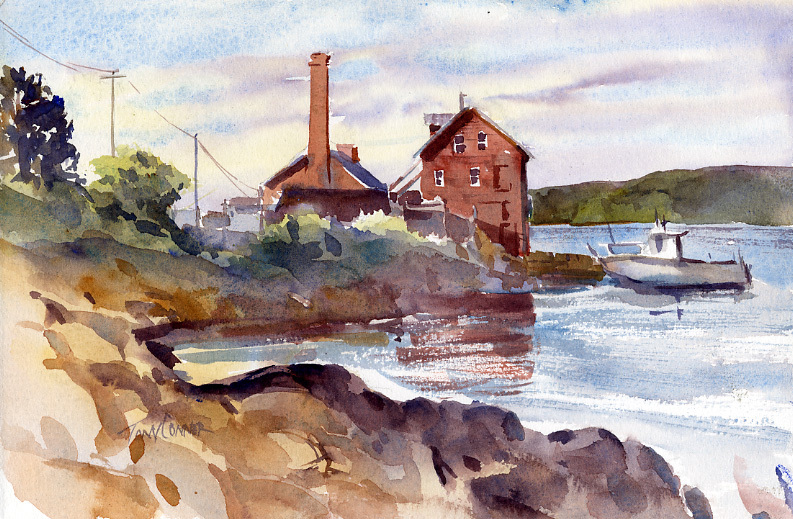 Gloucester, Massachusetts is an area much visited and painted by artists for many years. It is full of recognizable “motif’s” that have been depicted in many ways by many artists. This building, known as the “paint factory”, is one of those motifs. 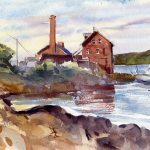 Many artists have created depictions of the paint factory over the years – some more than once. This happens to be my first. My viewpoint from a rocky outcrop game me an almost straight on, elevation, view. The redeeming quality of the view was the low and raking morning light. With that an uninspiring view came to life.